Next morning we caught an early morning flight from Beijing to Xian. We were met at the airport & checked in at the 4* Royal Garden Hotel. This hotel has a very good location right at the centre of Xi'an and also is of a decent international standard with good western breakfast. Our guide took us first to 'Muslim Street'. This is a good start to a tour of Xi'an, walking through this old part of the city along narrow lanes among shops & stalls selling local products such as Chinese medicine as well as souvenirs. Behind the shop fronts are many old Chinese houses. We arrived at the Great Mosque. The mosque is built entirely in the Chinese temple style of architecture among peaceful gardens & courtyards. 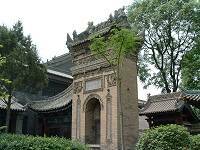 The entrance is via a huge red Chinese ceremonial gate into the many courtyards & gardens among the different temple halls & archways etc. 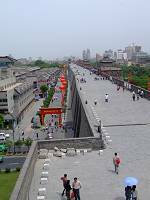 The city wall of Xi'an was built during the reign of first emperor of the Ming dynasty, and forms a rectangle enclosing the old city. The wall itself is 12m high, and the walkway along the top is also about 12m wide. You could, if you wanted, walk round the whole wall - but it would be a 14 km walk! The best views of Xi'an city are from the wall. From the South gate of the City Wall we walked to the Forest of Stone Tablets Museum. Here there is a large collection of stone tablets dating back to the Han, Tang & Ming dynasties. In the evening we enjoyed the local speciality, the Dumpling dinner. These are similar to the Cantonese Dim Sum dishes, but all different types of dumplings served in bamboo steamers. The second day was the highlight of our visit to Xian, the visit to the Terracotta Warriors Museum. This is one of China's top historical sights along with the Great Wall & the Forbidden City. One has to be there to witness this unique & magnificent treasure house of Chinese history as well as one of the most important archaeological discoveries of the 20th century. The place is normally packed with visitors & was more so during our visit because of the Golden Week public holiday. The wait & queue was well worthwhile once you enter the first underground vault of discovery. One has to be a little patient to get to the front of the platform to look at the magnificent army of Terracotta Warriors beneath. They line up in rows with some holding spears, daggers, axes or other weapons in long corridors between the earth walls. There are also horses among the warriors. Each life size warrior has a unique set of features & expressions. If you walk along the site on both sides of the vault you can look at some details of the faces & expressions of the warriors. The second & third vaults are smaller but deeper with fewer warriors discovered. The archaeologists believe that there are more warriors to be discovered in an even bigger site buried around the Tomb of emperor Qin Shi Huang (still unopened) about 1.5km away. I hope to return to this site again in a few years time to witness more as yet unfound discoveries. I walked away with overwhelming satisfaction that I have seen the most significant discovery of the 20th century. For me it also meshed with the Chinese history that I studied at school about the emperor Qin Shi Huang. As I left the centre I saw the famous farmer who first found this historical site in 1974 whilst digging a well. He now autographs copies of books at the souvenir shopping centre. 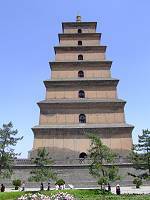 After lunch we returned to Xian city & visited the Big Goose Pagoda, which is a seven-storey pagoda built in 652AD in the Qing dynasty. Afterward we visited the History Museum. 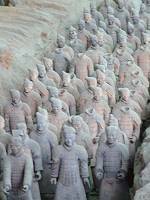 There are 4 magnificent terracotta warriors on display taken from near the tomb of Qin Shi Huang. The last visits of the afternoon were to hotels for inspection. We visited 3 sister hotels on Renmin Square, the 4* Mercure, 5* Grand Mercure & the 5* Sofitel. We use all of them for our Superior & Deluxe hotels as well as 4* Royal Garden Hotel & the 5* Hyatt. Tonight we saw the famous Tang Dynasty show. This award winning show with song, dance & wonderful traditional Chinese musical instruments is a highly entertaining culture show. It draws to the end a very exciting 2 days in Xi'an. Next morning we caught a local flight to Nanjing.